When you're traveling with an RV, you need to know where you can stop for the night. How do you find a place to park and set up? The same goes for Europe, but we'll concentrate on the U.S. here. What will make your experience traveling with an RV the most pleasant? One thing that we'll say right at the beginning is don't wait until late in the day to find a place to park. Just like when we find hotel rooms while traveling, we think it's best to have a place for the night by no later than 5:00 PM. There are lots of places to park that RV, but once you get there, you have to set it up, and you really want to do that in daylight if you can. In the U.S., you can't just pull off to the side of the road and park for the night, but there are plenty of options. There are RV parks all over the country. There are even some large store chains that allow you to spend the night in their parking lots... not scenic or private, but it's nice to know about if you need it. You'll find RV parks in cities and out in the countryside. 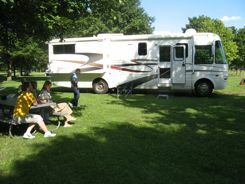 There are RV spaces in State Parks and National Parks. Many small towns have town parks with spaces. To Reserve In Advance Or Not? You can choose to drive and find places for the night as you go, or you can book your spot in advance. If you're going to a popular destination or a popular event, reservations in advance are a good idea. 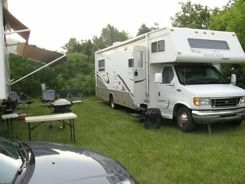 At some popular events where camping and RVing is the norm, places are sometimes reserved and paid for a year in advance! ...and we were LUCKY to get a coach and a spot two months in advance. Outside of those popular destinations you have more flexibility. You can look for signs advertising RV parks as you drive along. You can go on the internet and plan your route... making reservations at RV parks ahead of time. You can get an RV campground book and look them up and call ahead once you know how far you'll get in a day. We freely admit we know really very little, but here are some of the basics. Some parks come with just a place to park.... you need to get by with the power supplied by your batteries and the water your "rig" stores. Some but not all RV parks have "sewage dumps". You can figure that out.... I can't tell you more than that here. The amount of electrical power varies. We stopped at places that had 30 amps... that was OK, but 50 amps was better according to our friends. Everyone at the parks seemed friendly and helpful. We traveled with veteran RVers, but if you were a novice at traveling with an RV, I'm sure you could get help with your hook-up. And finding some of those little parks made traveling with an RV more of an adventure than we ever thought it could be. It was a terrific experience, and something we hope to do again.